The vision of fluffy big-eared bunnies overrunning a city may be a source of amusement for some. But it's no laughing matter for the Richmond Animal Protection Society (RAPS), who, quite literally, have rabbits coming out of their ears -- and their hats. RAPS is groaning under the weight and is struggling to cope with having to care for more than 40 unwanted or rescued rabbits. They're in the rabbit room, the hallway, the kitchen, the laundry room, the lobby and in the yard. Only last week, four more baby bunnies, bought recently at a local pet store, were handed into the shelter at the bottom of No.5 Road, south of Steveston Highway. Many more are being brought into the society by people finding them in distress in local parks, where unwanted pet rabbits are frequently dumped and roam free to breed uncontrolled. It's not the first time a call has been made for the city to take action against a spiraling population -- the last time being in the fall of 2006, when a cull was scheduled before disease took care of the problem first. And, with Easter fast approaching (a time when many people buy bunnies as presents), RAPS is asking the city to consider creating a bylaw banning the sale of rabbits. "It's out of control again, it really is," said Carol Reichert, RAPS Executive Director. "It will get even worse again if we don't do something about it very soon. A ban on the sale of rabbits in Richmond is a must. "We don't know where to stack them any more. We've been talking to the city about this and they said they're looking into it." An estimated 4,000 to 5,000 of them wreaked havoc on pumpkin crops in Richmond, causing tens of thousands of dollars worth of damage. The cull was scheduled for the fall of 2006, but by that time, nature took care of the problem with disease and starvation. 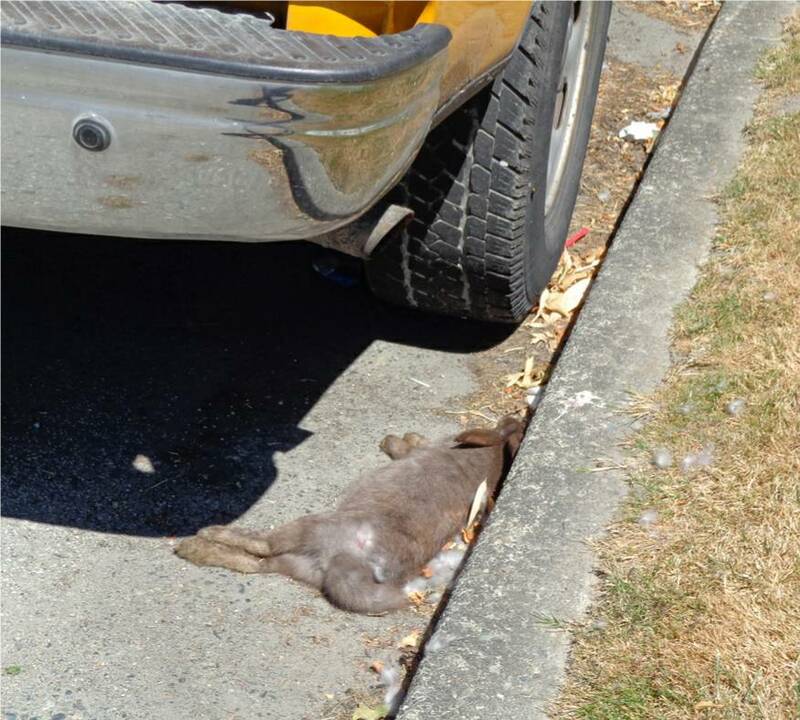 Now the city is again turning its attention to Richmond's pesky rabbit spike, although it's not clear at this stage whether the move will include an outright ban on the sale of rabbits. "The proliferation of rabbits and their abandonment in parks are concerns for the city," said spokeswoman Diana Waltmann. "There has been some informal discussion between board members of RAPS and staff around various animal welfare issues, including rabbits. "Bylaw staff is reviewing the Animal Control Bylaw and Section 12.8 of the Business Regulation Bylaw and expect to bring a report forward for council's consideration this spring with recommendations to potentially mitigate this problem." The city advises residents, who are considering buying a rabbit as a pet, to be aware of the commitment required to care for one. They have a life span of seven to 12 years and, if a female is not spayed, she has the potential of having 200 offspring during her lifetime. "There are hundreds of them roaming around everywhere in the city and they're still pumping them out at pet stores for $20 or less," Reichert said. "The stores make their money on all the stuff that goes along with rabbits, but most of the time it's an impulse buy and either we get left to carry the can or the animal gets dumped. "Yes, we can look after them here, but it's a sad life. And it takes a lot of work cleaning out 40 cages every day, we're struggling to look after them." Carmina: It's a step in the right direction. Kelowna's already passed a bylaw prohibiting the sale of unaltered rabbits and other municipalities like the District of North Vancouver are in the process of amending the Pet Shop Regulation Bylaw regarding the sale of sexually intact rabbits. The Rabbit Advocacy Group of BC fully endorses the implementation of a new bylaw that would ban the sale of unsterilized rabbits in pet stores. Most rabbits are bought on impulse as babies, and subsequently given up to humane societies, rescue groups, or abandoned unneutered into the outdoors in less than six months. Dumping a rabbit into the environment is the method of choice for most people, as it's quick, easy, and guilt-free. Municipalities like Richmond, Kelowna, Nanaimo, and Victoria are overrun with domestic rabbits and their offspring. 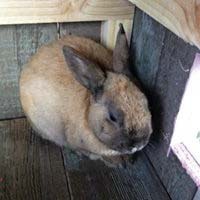 Additionally, shelters and pounds are always at over-capacity with unwanted rabbits. Just visit RAPS. I've received numerous calls over the years from the public who realize they've made a mistake in buying a rabbit, and who were given no information or misinformation by staff working in pet stores like Petcetera. The bottom line is the pet industry is a business, with the sole motivation being profit. Employees are instructed to sell to the first potential buyer, disregarding the welfare of the animal. On PJ's Pets website it lists rabbits, guinea pigs, hamsters and others like them as animals requiring "minimal care and space" and "due to their relative affordability" suitable as a "great first pet for a child." This is not only irresponsible, but financially inaccurate, and indicates an utter lack of knowledge surrounding the complex needs of rabbits. Pets are lifetime commitments, and not objects to be disposed of when it becomes inconvenient. Sadly, we're still hearing from parents who say the kids have "outgrown" their rabbit. Has the City checked where the rabbits come from that end up in the stores? Are they healthy? Do they come from mills? Backyard breeders? The public has never been provided with this information. We raised our concerns to the BC SPCA but they went unanswered. It's time for action that would protect these creatures, the consumer, the environment, and our communities. Stores that focus on natural, organic, and better pet products, supplements, and supplies are the way of the future. Increasingly, the public is making ethical choices, and demanding that animal welfare issues be addressed by government. Preventative measures are far less costly than reactive ones, and in keeping with the changing times and societal attitudes, I urge council to bring in new legislation that would put an end to the sale of unaltered rabbits in pet shops. Kelowna has already done so, with the District of North Vancouver, the District of Coldstream, and the City of Vernon expecting to do the same in the near future. It just makes good sense all round. Please send your letter supporting the bylaw. It is expected to go to council in November. When animal rescue volunteer Christie Lagally pulled a rabbit out of a hat -- OK, it was a travel crate -- in front of a city hall committee, she wasn't certain what effect her trick might have. Little did she know the magical effect an abandoned, white, six-week-old ball of fluff called Clarice would have on Richmond's councillors. In an attempt to tackle the city's massive stray rabbit population, the committee was asked to consider a ban on the sale of unspayed or unneutered bunnies. But after Clarice's cameo appearance and Richmond Animal Protection Society (RAPS) volunteer Lagally's presentation, city staff have now been asked to investigate the possibility of a total ban on the sale of rabbits in the city. If the plan goes ahead, the only place you will be able to legally obtain a rabbit in Richmond will be through adoption from a registered rescue centre. "She's a very good example of rabbits being abandoned," Lagally told councillors, while holding Clarice, who was found suffering and in pain in Minoru Park. "She was injured by another animal in the park. She has blue eyes and is white, so we know she's a domestic breed." 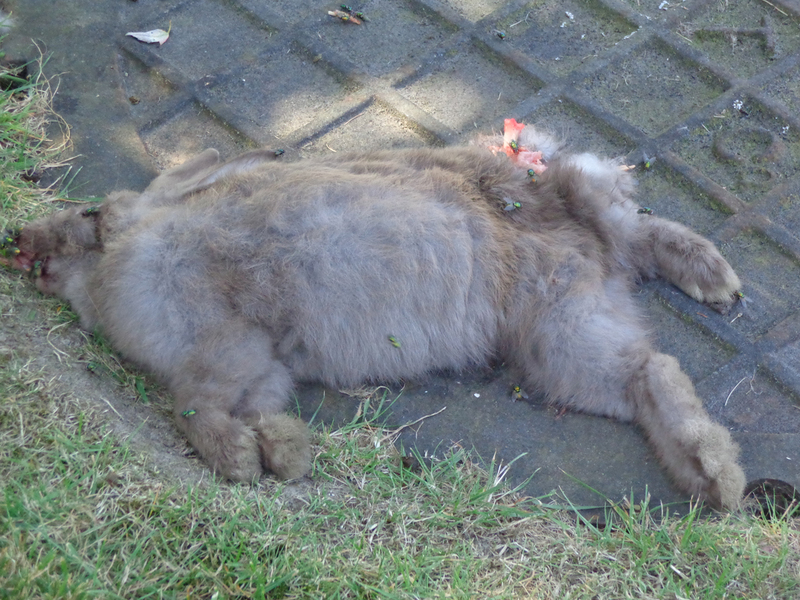 In March of this year, the News reported that RAPS was overrun by unwanted or rescued rabbits, most of which were plucked from the huge population of rabbits running loose and breeding in the city. At-large domestic rabbit breeds are damaging public parks' flowers and plants, defecating all over the grass, damaging farmers' crops and being killed or injured by vehicles. The report placed before committee Tuesday evening sought to address the problem by implementing a bylaw, which would ban pet stores from selling an unspayed or unneutered rabbit and force them to produce a certificate proving the animal had been fixed. Any attempt by stores to flout the proposed ban or fail to produce the certificate would attract a $100 fine. "Fixing" the rabbit can cost as much as $200. And with stores, such as PJ's Pets in Richmond, selling rabbits for $54, the cost of fixing may in itself price the animal out of the market and off the shelves. But Lagally's husband and RAPS treasurer, Eric Lagally, told committee that an outright ban is the only way to deal with Richmond's rabbit problem. "We're in full favour of the ban on the sale of unsprayed or neutered rabbits," Eric Lagally said. "But the rabbit can still be abandoned after the sale, even if it's been fixed. So it doesn't really solve the abandonment problem. To truly solve the problem, we must stop the sale of rabbits." Eric Lagally also said there's no screening process in pet stores for prospective owners, such as the ones at RAPS and the SPCA. "Those processes require the adoptive owner to sign a contract that if they can no longer care for the rabbit, then it's returned to the shelter," he said. City staff conducted a phone survey of all licensed pet stores and adoption centres in Richmond that sell live animals. Only PJ's Pets sold unfixed rabbits. The city's survey estimated that the store sold about 260 of them every year. A delegation from PJ's Pets told committee that they do, in fact, educate the customers who buy their rabbits. "We educate everyone that comes in here, we don't just hand them the rabbits," the PJ's Pets representative said. "We make sure people know their responsibilities. "People will still go on Craigslist or to another city and get what they want anyway, with no education. You might end up with a worse problem than before." In answer to the PJ's Pets delegation, Coun. Sue Halsey-Brandt said that she hoped that other neighbouring cities may follow suit, making it even more difficult to buy a rabbit. "We're just trying to take the impulse purchase of the rabbits out of the equation," Christie Lagally said. "At the end of the day, it's (RAPS) that is left to look after these animals and it's the Richmond taxpayer who has to fund the clean up. "To be honest, they're not the ideal pet for young children, as they need quiet and calm and are prone to heart attacks." Lagally further asked if the proposed bylaw fine could be increased to $200 to offer more of a deterrent. Councillors Harold Steves and Ken Johnston said they were both willing to support an outright ban on the sale of rabbits. The PJ's Pets people continued to argue that such a ban would only force the bunny sales into the backyard black market. City staff, however, were asked by the committee to come back in January with their findings on a possible outright ban. Faced with a growing rabbit population, Richmond wants to ban the sale of bunnies at local pet stores. "People think they're a cute little bunny, then they start to smell, bite and scratch after about six months," Coun. Harold Steves, chair of the parks and recreation committee, said Tuesday. "They don't become pets like dogs or cats. You can't let them out of their cage. They end up being released and creating problems," he said. 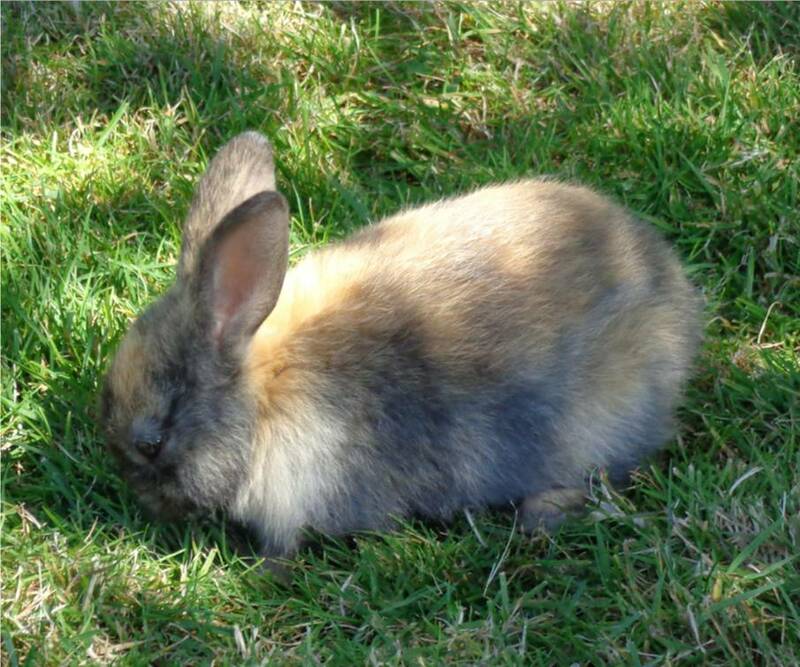 Richmond staff have already prepared a bylaw to ban the sale of rabbits. The bylaw is being expanded to include puppies and exotic species that also end up being unwanted. "Non-native painted turtles are a tremendous problem. They displace native species. They grow up quite big and are in every canal," said Steves. "When unwanted dogs are released, they end up getting sick and malnourished," he said. One pet store sells about 260 rabbits annually at a price of $54 each. The Richmond Animal Protection Society houses 42 rabbits and adopts out about one per month. Steves said one farmer had a terrible time with his pumpkin patch. During the day, rabbits hid at a nearby Christmas tree farm. They came out at night to eat the pumpkin seeds. "They could smell the seeds. They dug up the seeds three times," said Steves. Nor are the pesky critters limited to the wilder parts of the city. They have also been seen in the downtown area near city hall. "If we ban the sale, the population will eventually get under control," said Steves. How would Counc. Steves like to spend his life in his bathroom? Saying rabbits shouldn't be let out of their cages is tantamount to advocating animal cruelty. Richmond should demand more of their council - it's so easy to get the facts straight nowadays. Rabbits make wonderful house pets when spayed or neutered if they have responsible owners. But, like any pet, they are work and cost money. Although I applaud Richmond for attempting to pass a law prohibiting rabbit sales in pet stores, it has let the rabbit problem go on for too many years, and thousands of animals have suffered greatly because of it. Let's hope the rest of the council is bright enough to at least do some research. Hint: google.ca. Note: Writers took exception to the “ignorant” comments made by Councillor Steves and set him straight. In the following, I chose to interpret them in a positive manner. Surely, this longtime farmer and politician knows better. It's to be commended that Richmond is creating new bylaws regarding a sales ban of rabbits and other animals in pet stores. Let's hope legislation is in place before Easter, and that people start valuing their pets as lifetime commitments. While I agree with Coun. Steves that rabbits require specialized care, to say you can't let them out of their cage is both unfair and inhumane. Just like you and me, all creatures enjoy their freedom and need exercise to stay healthy. Perhaps the bigger issue that we all need to think about is how our control, our sense of ownership and entitlement, and the legal status of animals as property has caused so much suffering and death. On Monday, council made its first move by unanimously voting to ban pet stores from selling rabbits. "This is the first step toward a total ban on animal sales. The fact of the matter is I think that's the right direction," said Johnston. Council earlier considered requiring pet stores to spay or neuter their retail rabbits instead of creating a ban, but it noted enforcement would be a challenge. Once the new bylaw language is ratified, council is expected to consider banning the sale of dogs at retail stores. February 8, 2010 PIJAC (Pet Industry Joint Advisory Council) had recently run an ad campaign in the Richmond Review urging people to contact their city councillors to fight against the ban and future bans by the Richmond Council on cats and dogs. It fell on deaf ears. Mayor Brodie said that the sale of live animals costs the city financially, and that there's animal suffering to consider as well. The bylaw, Prohibition on the Sale of Rabbits in Pet Stores, passed unanimously and takes effect within a special time period - a mere 30 days, rather than the standard 90 days. Staff will also send a letter outlining Council's decision to all other Greater Vancouver city councils, urging them to follow suit. Thanks to the many supporters who made this possible! Pet abandonment is an indictable offence under the Criminal Code of Canada & an offence under B.C.’s Prevention of Cruelty to Animals Act. It is illegal, immoral, and cruel. As it stands now, the perpetrators know it's likely they'll never be apprehended & face the courts. Let’s correct this wrong! July 30, 2017: Rabbit Advocacy was notified about a large number of rabbits in the area behind Ikea in Richmond. We went to take a look, and upon arriving, immediately discovered a deceased rabbit on the roadway, struck by a vehicle, and another one, deceased, on the grassy area beside the sidewalk. A crow was pecking at the carcass. We removed the remains. Two young adults were nearby munching on the grass. Tragically, the cycle of unwanted rabbits being dumped into the environment by thoughtless owners will continue unless there is a radical shift in consciousness. Having a pet is a responsibility not to be taken lightly. So what, if anything, is the City of Richmond and the Richmond Animal Protection Society, (recently rebranded as the Regional Animal Protection Society), doing to address this long-standing issue? January 1, 2018 While some areas in Richmond, including Jacombs Rd, around the Auto Mall and Ikea, continue to see fluctuating populations of domestic rabbits and their offspring, the City remains relatively silent on the matter. City of Richmond Animal Regulations. April 11, 2018 Nearly two weeks ago two young deceased feral rabbits were found outside Richmond’s animal shelter on No. 5 Rd. They were diagnosed with the highly contagious rabbit hemorrhagic disease (RHDV-2) and now all 66 of the facility’s adoptable rabbits will be killed. It’s heart-rending. Environmental liaison councillor Carol Day didn’t think any action would be taken on the matter even in light of the RHD-2 virus and if the rabbits died, well, that’s ‘nature’s way.’ What a reckless and thoughtless statement. Dead carcasses should always be removed in a prompt manner for obvious reasons. With this virus, it is vitally important that the transmission and spread from infected rabbits be curtailed. Clearly, that hasn’t worked. In 2006, the headline from The Province read: The Richmond rabbit epidemic is no surprise. Today, the situation remains the same, if not worse. As well, the dilapidated animal shelter is a disgrace to the community. It’s time for new ideas and a new approach. There is a community meeting on May 23rd and a civic election on October 20th of this year. Discarded rabbits and their offspring continue to be seen and rescued in Richmond, including from around Ikea, No. 2 Rd. Bridge, and the Richmond Auto Mall. We need new ideas, policies, and a commitment to working together on solutions to help our rabbit friends.